There is a widespread feeling among U.S. adults that the workplace is evolving and they will have to continually update their skills and training in order to succeed in a career. A narrow majority (54%) of adults who are currently in the labor force say that it will be essential for them to get training and develop news skills throughout their work life in order to keep up with changes in the workplace. An additional 33% say this will be important, but not essential. Only 12% of workers say ongoing training will not be important for them. Even among employed adults who say they have the skills and education they need to get ahead in their job, roughly half (47%) say they will need ongoing training throughout their career. For some people, acquiring new skills won’t be a necessity just in the future: 35% of working adults say they need more education and training now in order to get ahead in their job or career. A plurality of those who say they need more training say the best way for them to get that training would be through additional higher education. This is true across levels of educational attainment: Pluralities of four-year college graduates say they would pursue a graduate degree, two-year college graduates say they would try to get a four-year degree, and high school graduates say they would go to college. About a third of workers who say they need more training believe receiving on-the-job training would be the best way to gain the skills they need to get ahead, while fewer point to certificate programs as the most promising pathway. Roughly four-in-ten employed adults (45%) say they have taken a class in the past year or have gotten extra training to learn, maintain or improve their jobs skills. About half of these workers report that they did this at the behest of their employer, but significant shares also report that they sought out additional training in order to earn more money, get a new job or get a promotion. While the skills American workers rely on to do their jobs vary widely by education and industry, interpersonal, communications and analytical skills are the most dominant across fields. And the skills that U.S. workers are using in their jobs these days don’t necessarily coincide with what most Americans view as the cutting-edge job skills of today. While an overwhelming majority of adults (85%) say having a detailed understanding of how to use computer technology is extremely or very important for a worker to be successful in today’s economy, far fewer employed adults say they need this skill set in their current job. Overall, 54% of U.S. adults in the labor force say that, in order to keep up with changes in the workplace, it will be essential for them to get training and develop new skills throughout their work life. A third say, while not essential, it will be important for them to continually update their skills. Young adults are more likely than their older counterparts to see skills and training as essential (61%), perhaps because of the longer trajectory they have ahead of them. Even so, 56% of those ages 30 to 49 say ongoing training will be essential for them, as do roughly four-in-ten workers ages 50 and older. There is a significant education gap in perceptions about the need for ongoing training and skills development. Fully 63% of those with a bachelor’s or graduate degree say it will be essential for them to update their skills in order to keep up with the pace of change in the workplace. Some 57% of those with a two-year college degree say this will be essential for them, as does a similar share of those with some college education but no degree (54%). Among those with a high school diploma or less, 45% say it will be essential for them to get training and develop new skills throughout their career. To be sure, many workers are already engaged in an ongoing effort to improve their skills or learn new ones. Fully 45% of employed adults say that, in the past 12 months, they have taken a class or gotten extra training to learn, maintain or improve job skills. Workers younger than 50 are somewhat more likely than those ages 50 and older to say they have sought out this type of training (47% vs. 39%). In keeping with the finding that more highly educated Americans are among the most likely to say they will need to keep their skills up to date throughout their work life, 56% of working adults with a bachelor’s degree or more education say they have taken a class or gotten training in the past 12 months, as do 54% of those with a two-year college degree. Among those with some college education, 43% say they have taken a class or received training in the past 12 months. By comparison, 30% of workers with a high school diploma or less education say they have done this. Roughly six-in-ten workers in the health care (58%) and education (62%) fields say they have gotten training or taken a class in the past year.28 Workers in the hospitality (28%), retail and trade (32%) and manufacturing and farming (34%) sectors are significantly less likely to report the same. Workers are somewhat less likely to report having taken a class or gotten extra training for a license or certification – 30% of all workers say they have done this over the past year. Once again college graduates are among the most likely to have taken these steps, while those who never attended college are among the least likely. Adults who work in the health care industry are among the most likely to say they have had training or taken a class related to licensing or certification – fully half (49%) say they have done this in the past year. About a third of workers in the education sector (32%) say they have taken a class related to licensing or certification in the past year, as do roughly a quarter of those working in manufacturing and farming and in hospitality. Overall, 37% of employed adults report that they have taken a class or gotten extra training – either to improve their job skills or work toward a license or certification. Among this group, about half (52%) say they did this because their employer required it. Roughly a third (34%) say they needed the extra training in order to earn more money. And about a quarter say they needed the extra training in order to get a new job (26%) or to be promoted in their current job (25%). Younger workers who took a class or got extra training in the past year are much more likely than their older counterparts to say they needed to do this in order to get a new job – 38% of workers younger than 30 say this is a reason that they got extra training, compared with roughly one-in-five (21%) workers age 30 or older. The motivations for seeking additional training are highly correlated with workers’ income. Among those who say they took a class or got additional training in the past year, 47% of workers with annual household incomes less than $30,000 say they did this in order to earn more money. Some 37% of middle-income workers (those earning between $30,000 and $74,999) say the same. 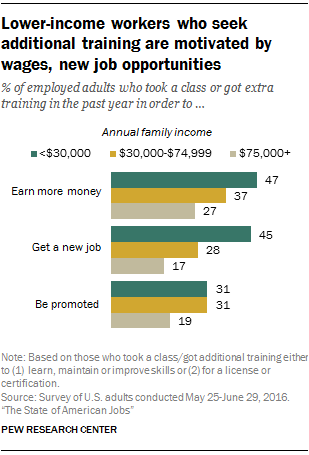 And for those with incomes of $75,000 or more, only 27% say earning more money was a reason why they sought additional training. Similarly, while 45% of lower-income workers say they took a class or got more training in order to get a new job, fewer middle-income (28%) and higher-income (17%) workers say the same. Among workers who have not taken a class or gotten extra training in the past year, the vast majority (74%) say they didn’t need to take these steps in order to advance in their job or career. For the remaining 25% of this group, having the time and resources to seek out additional training can be significant barriers. Among those who may have needed training in order to advance in their job but did not get it, some 57% say that the inability to take time off from work or from other responsibilities was a contributing factor. (This translates into 14% of all workers who did not take a class or get extra training in the past 12 months.) And 45% of these workers say they couldn’t afford to take a class or get additional training. Relatively few (26%) say that they didn’t know this type of training was available. Among adults who are unemployed but looking for work, 26% say they took a class or got extra training in the past year to help them get a job. Those with at least some college education are significantly more likely than those who never attended college to say they took this step (34% vs. 18%). Among those who did not take a class or get additional training in order to help them get a job, 64% say they couldn’t afford to do so. Some 55% say they couldn’t take time away from other responsibilities, and 35% say they didn’t know this type of training was available. While most workers expect training and skills development to be an integral part of their work life in the future, and many are taking classes and getting certifications in real time, about a third (35%) of workers say they lack the education and training necessary to get ahead in their current job; 64% of employed adults say they have the education and training needed to get ahead. Not surprisingly, younger workers are among the most likely to say they do not have the necessary training to get ahead in their current job. Some 46% of workers younger than 30 say they don’t have the education and training they need to get ahead in their job. About a third (34%) of workers age 30 to 49 say the same, as do 26% of workers ages 50 and older. Educational attainment is linked to workers’ feelings of job preparedness, but mainly at the extremes. Workers with a postgraduate degree are by far the most likely to say they have the necessary education and training to get ahead in their job or career. Among this group, 82% say they have what they need to get ahead; only 16% say they need more education and training. Among workers with a bachelor’s degree, a two-year college degree, some college or a high school diploma, roughly equal shares say they need more education and training in order to get ahead in their current job. Workers who lack a high school diploma are among the most likely to say they need more education and training (50%); only about half (48%) say they have the training they need to get ahead. For workers who feel ill-equipped to get ahead in their current job, there is no clear-cut solution for obtaining more education and training. Pluralities say going back to school to obtain a higher degree would be the best way to get the training they need. But a significant share say on-the-job training aimed at learning or improving a specific skill would be the best approach for them to take. A smaller share say pursuing a certificate program in a professional, technical or vocational field would be the best way for them to get the training they need. Among workers with a bachelor’s or graduate degree who say they need more education or training to get ahead in their career, 43% say the best way for them to get the training they need would be to pursue postgraduate education (a graduate degree for those with a bachelor’s, and an additional graduate or professional degree for those who’ve already completed graduate schooling). About three-in-ten (28%) of these workers say on-the-job training would be the best avenue to pursue, and 22% say they would complete a certificate program. The pattern is similar for workers with less formal education who say they need more training to get ahead in their job. Among those with a two-year college degree, 48% say they would get a four-year degree, while 26% say on-the-job training would be the best approach to take and 17% say they would complete a certificate program. And for those who haven’t completed college, a plurality (43%) say they would pursue a two-year or four-year college degree in order to gain the training they need to get ahead at work, a third would turn to on-the-job training and 14% say they would complete a certificate program. Across levels of educational attainment, women are more likely than men to say that pursuing formal education would be the best way to get the training they need to get ahead in their current job. Among those who say they need more education and training, 52% of women and 35% of men say getting a higher degree would be the best approach. Men are more likely than women to say that on-the-job training would be best (36% vs. 25%) or to say they would pursue a certificate program in order to get the training they need (20% vs. 13%). Workers who say they would opt for on-the-job training are mostly positive about their prospects for getting it. A majority (65%) say their employer offers this type of training. An additional 14% say that while the training may not be offered in their workplace, their employer would help them get the training they need. Some 16% say their employer would not assist them in getting training. Among adults who are unemployed and looking for work, only about half (46%) feel they have the education and training needed to get the kind of job they want; 52% say they need more education or training. These job seekers are divided over the best approach to getting the qualifications they need. About four-in-ten (42%) say getting additional formal education would be the best way. Roughly the same share (37%) say completing a certificate program in a professional, technical or vocational field would be a better strategy. An additional 16% point to some other approach. In today’s high-tech, information economy, most American workers rely more on soft skills than on technical skills to do their jobs. Fully half of employed adults say interpersonal skills such as patience, compassion and getting along with people are extremely important in their job. An additional 40% say these skills are very important. This skill set is especially important for workers who are in the health care and education sectors – 64% of health care workers and 67% of education workers say it’s extremely important for them to have interpersonal skills in order to do their job. A similar share of workers say they rely heavily on critical thinking skills such as evaluating facts and making decisions in doing their jobs. Some 46% of all workers say these skills are extremely important in doing their job, and 40% say they are very important. Again, these skills are more important to workers in the health care and education fields than they are for workers in the hospitality, manufacturing and farming, and retail sectors. Good written and spoken communications skills are highly important as well. Some 45% of workers say it is extremely important that they have good communications skills in order to do their job, and 44% say this is very important. These skills are most important for people working in education. Management and leadership skills are extremely important for three-in-ten of today’s workers, and an additional 40% say these skills are very important. These skills cut across industries, with roughly equal shares of workers saying they rely on them to do their job. About three-in-ten workers (28%) say computer skills such as word processing or creating spreadsheets are extremely important for their job. A third tier of job skills includes a mix of analytical and manual skills. Some 14% of workers say it’s extremely important for them to have high-level math, analytical or computer skills in order to do their job, and an additional 25% say these skills are very important. One-in-five workers say the ability to do physical or manual work or use hand tools is extremely important in their job, and 12% say it’s extremely important for them to be able to operate, build or repair machinery or equipment. As would be expected, these skills are particularly important for workers in the manufacturing and farming industries, and they are also relied upon by those who work in the hospitality or service industries. The skills that American workers use in their jobs differ considerably by educational attainment. Even among college graduates, there are significant differences in the skills used by workers with a graduate or professional degree compared with those with a bachelor’s degree. For example, on critical thinking, 67% of workers with a postgraduate degree say it’s extremely important for them to have these skills in order to do their job. Some 54% of workers with a bachelor’s degree but no graduate degree say the same. A similar gap exists between these two groups of workers when it comes to having good written and communications skills. There are also large gaps between those with a bachelor’s degree and those with an associate’s degree or some college experience but no degree. For example, 40% of workers with a bachelor’s degree say basic computer skills are very important in their job; 24% of those with some college but no bachelor’s degree say the same. In addition, there are significant skills gaps between those with some college experience and those who never attended college when it comes to using interpersonal skills, critical thinking, communications skills, management and basic computer skills at work. Workers who never attended college are more likely than those with higher levels of education to say they rely heavily on their ability to perform manual and physical work and to operate machinery or equipment in doing their job. Other soft skills such as management, critical thinking and communications skills are acquired in different ways, according to the workers who rely on those skills to do their jobs. Among workers who said management or leadership skills are extremely or very important for their job, a majority (68%) say they learned those skills through work experience. Only 8% say they learned those skills in their formal education, and 5% say they taught themselves those skills. Work experience is also a valuable source of learning for workers who say it’s important for them to have critical thinking skills in their job. Some 46% of this group says they learned these skills on the job. About one-in-five (19%) say they acquired these skills in their formal education, and a similar share (18%) say they gained these skills through life experience. Workers are more divided when it comes to where they learned written and spoken communications skills: 42% say they picked up these skills through their formal education, while 30% say they learned these skills through work experience. An additional 12% say they learned these skills through life experience or self-teaching. Those with at least a bachelor’s degree are more likely than those with less education to say they learned communications skills and critical thinking through their formal education. For some other job skills that are less widely relied upon, on-the-job training is also crucial to learning. Among workers who say being able to operate, build or repair machinery or equipment is extremely or very important for their job, 70% say they learned these skills through work experience, while only 3% say they acquired these skills through formal education. One-in-ten say they learned those them through life experience. Similarly, many workers who say it’s very important for them to be able to do physical or manual work or use hand tools say they learned those skills on the job rather than through formal education (57% vs. 6%). One-in-four volunteer that those skills came through life experience. Workers who rely on basic computer skills and high-level analytical skills say they picked those skills largely through a combination of work experience and formal education. Among those workers who say basic computer skills such as word processing and creating spreadsheets are important skills for them to have, 34% say they learned these skills on the job, while a similar share (32%) say they learned these skills through their formal education (20% volunteer life experience). When it comes to high-level math, analytical or computer skills, 43% of workers who say these are central to their jobs say they learned these skills in their formal education. Some 34% say they learned them through work experience. 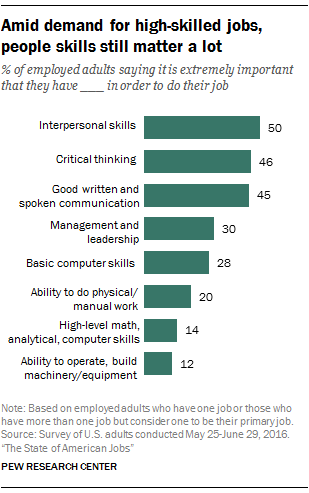 Relatively few (5%) say they picked these skills up on their own. Another finding from the survey echoes the notion that, for many workers, the most important job skills they have are developed in the workplace rather than in the classroom. A solid majority (73%) of employed adults say that someone with less education than them could develop the skills and knowledge needed to do their job. Workers with a graduate or professional degree stand out in this regard. This is the only group of workers in which a majority does not say others with less education could be trained to do their job. Even so, 50% of working adults with a postgraduate degree say someone without a similar degree could develop the skills and knowledge to do their job; 50% say they don’t think someone with less education could do it. Among those with a bachelor’s degree, 65% say someone with less education could learn to do their job, and the shares are significantly higher among those with some college (82%) and those with a high school diploma (80%). The relatively small share of workers (14%) who say they rely heavily on high-level math, analytical or computer skills to do their job are among the most likely to say someone with less education than them could not develop the skills to do their job (39% say so). By comparison, among those who say they rely on their ability to do physical or manual work or on their ability to operate or repair machinery, about half as many (20%) say someone with less education than them could not learn how to do their job. Half of all working adults say they have about the right qualifications for their job, but a significant minority (41%) say they have more qualifications than their job requires. Relatively few (9%) say they have only some of the qualifications needed to do their job. These perceptions differ by educational attainment. Employed adults with a bachelor’s degree or more education are among the most likely to say that they are well-suited for their job: 54% say they have the right amount of qualifications, 41% say they have more qualifications than are required, and 4% say they are underqualified for their current job. Workers with some college education or a high school diploma are more evenly split over whether they have the right qualifications or more qualifications for their current job. Those who did not complete high school have a much different view. A quarter of these workers say they have more qualifications than their job requires, while fully a third say they have only some of the needed qualifications.